Meteor Cherry This tree is ‘Mountain Grown’ at Alpha Nursery and is an ‘Idaho Preferred’ Plant. 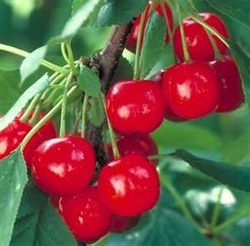 Meteor Cherry is a compact fruit tree, a great size for a backyard. It produces fragrant white flowers in spring followed by loads of bright red sour cherries in mid-summer, which are excellent for pies and jam. This tree is self-pollinating and very hardy. Meteor Cherry likes to be planted in full sun. The cherries are excellent for cooking and baking, making jams and jellies and wine-making. They can be messy if allowed to drop on the lawn or walkways or driveways. This cherry is a self-pollinating. It has smooth dark red bark which adds interest to the landscape. Fruit trees attract wildlife, birds, and bees. They are good for fresh eating, making jams, jellies, sauces, and pies.